周冬梅, 孔灵菲. N-乙酰半胱氨酸对哮喘小鼠气道上皮细胞自噬水平的影响[J]. 中国医科大学学报, 2018, 47(7): 626-630. ZHOU Dongmei, KONG Lingfei. Effect of N-acetylcysteine on Autophagy in Airway Epithelial Cells in Asthmatic Mice[J]. Journal of China Medical University, 2018, 47(7): 626-630. Abstract: Objective To determine whether N-acetylcysteine (NAC) can inhibit autophagy in airway epithelial cells in bronchial asthma mice. Methods Specific pathogen free BALB/c mice were randomly divided into the health control group, the bronchial asthma group, and the NAC treatment group. Airway responsiveness and total cell count in bronchoalveolar lavage fluid were examined. Lung tissue sections were used for hematoxylin and eosin, Masson's trichrome, and Alcian blue/periodic acid-Schiff staining to evaluate airway inflammation and remodeling. 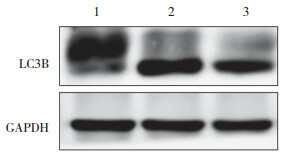 Microtubule-associated proteins light chains 3B (LC3B) immunofluorescence staining, electron microscopy, and Western blotting were used to assess autophagy levels in airway epithelial cells. 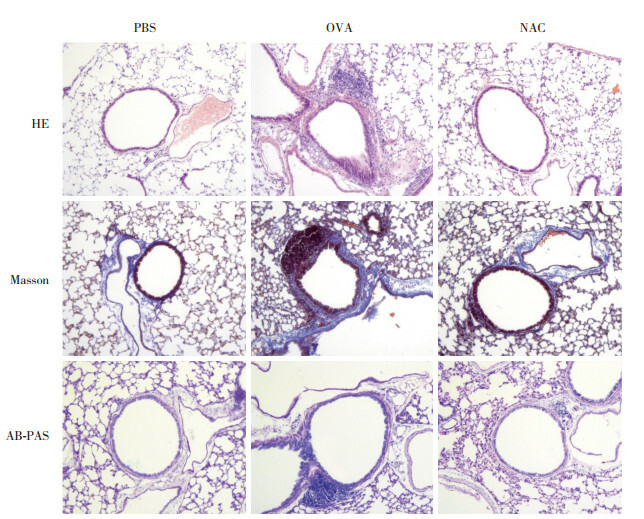 Results NAC significantly inhibited airway inflammation in bronchial asthma mice and reduced collagen deposition and mucus secretion in the airway epithelium. 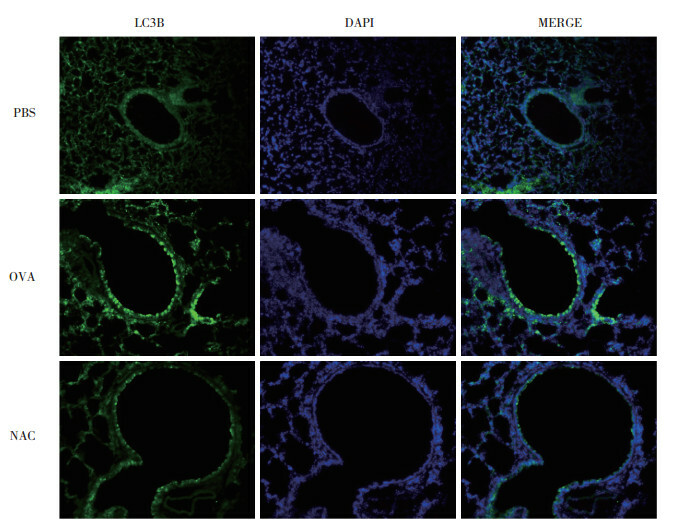 LC3B immunofluorescence and Western blotting analysis revealed that NAC reduced the level of autophagy in airway epithelial cells, and electron microscopy examination showed that the autophagosome number decreased in the NAC treatment group. Conclusion NAC can reduce airway inflammation and remodeling by inhibiting the autophagy in airway epithelial cells. 1）P < 0.001 compared with PBS group；2）P < 0.001 compared with OVA group. 1）P < 0.05 compared with PBS group；2）P < 0.05 compared with OVA group. EFTEKHARI P, HAJIZADEH S, RAOUFY MR, et al. Preventive effect of N-acetylcysteine in a mouse model of steroid resistant acute exacerbation of asthma[J]. EXCLI J, 2013, 12: 184-192. ALIYALI M, POORHASAN AMIRI A, SHARIFPOOR A, et al. Effects of N-acetylcysteine on asthma exacerbation[J]. Iran J Allergy Asthma Immunol, 2010, 9(2): 103-109.